Automata Noir Review — GamingWithSwag.com - Dads By Day, Gamers By Night. 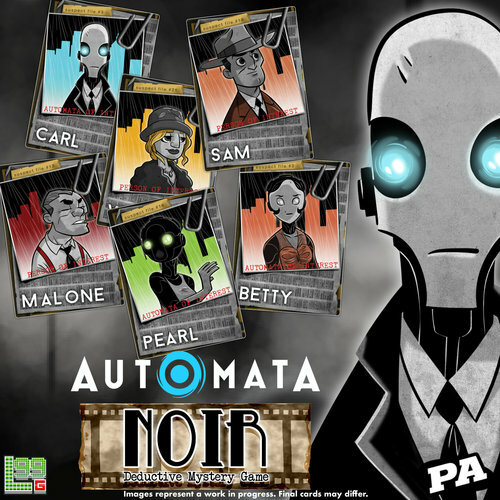 Automata Noir is a reimplementation of Noir: Deductive Mystery Game set in Penny Arcade’s Automata universe. In it, players are either a fiendish murder who must kill 10 suspects and/or the opposing detective or they are the said detective(s) who wins by accusing the killer. The game is played on a 5x5 grid of suspect cards. At the start of the game both players secretly pick identities from the evidence deck that will tell them which character on the board they are. From there players alternate taking an action which will let them either move the suspect cards around the board or kill/accuse an adjacent suspect card which can allow the player to win if they’ve found their opponent (doing this though can give away your position too!). In addition to the basic actions each player has special actions unique to their role. The killer draws an extra evidence card at the beginning of the game and can use and action to switch between them. The inspector, on the other hand, starts with a hand of three evidence cards and can take an action to place one over a suspect card on the board, then the killer must tell you if they are adjacent to that space. The detective also gets a last-ditch action, which allows the player to guess the identity of the killer, winning if they guess correctly and loosing if they guess incorrectly. The game also contains a number of multiplayer game modes that are similar to the basic two player version with some added rules for variety. These modes are also a little more complex but still not hard to learn. It’s a nice addition and goes a long way to spicing up the game. This game has a very well written rules set. It’s not a super complicated game but that doesn’t always mean that the rules will be easy to understand. This game, however, has one of the nicest written rulebooks I’ve seen in a long time. Lvl 99 also published each rule set in its own separate rules sheet, nice touch! Let me admit up front that I’m not a Penny Arcade super fan or anything, but I have read their Automata comics and quite enjoyed them. Automata Noir does a fantastic job of capturing the feel of the aforementioned comics, but even more so, it captures the feel of an old-timey noir film. It’s easy to get sucked into the cat and mouse chase between the two players. I felt myself getting nervous when I thought the killer was close and catching them was like solving a real mystery. Lay out the suspect tiles, draw some evidence cards, and you are ready to go! Let’s start with the art. This game is beautifully illustrated by artist Charles Bates who does fantastic job of keeping the Penny Arcade style without looking derivative. All of the suspects look unique and interesting. On the side of physical quality, the suspect tiles are hefty and the cards are nice stock. Automata Noir is quick, fun, and suspenseful. I would hope that the Penny Arcade theme wouldn’t turn anyone off because this game is great. I’m usually luke warm on deduction games but this one sucked me in. If you’re looking for a good cat and mouse style game, do yourself a favor and check this one out!